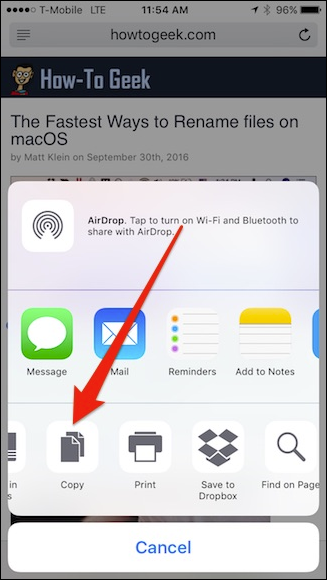 In macOS Sierra and iOS 10, Apple added a new feature to Continuity called “Universal Clipboard”. Universal Clipboard allows you to copy something on your iPhone, and paste it on your Mac–or vice-versa–using iCloud. Universal clipboard isn’t an advanced feature. For example, you can only copy and paste one operation at a time, so anything currently in the clipboard will be overwritten when you copy something new. Additionally, anything in the universal clipboard will expire after about two minutes. For Continuity to work, you’ll want to make sure that all devices are connected to the same iCloud account and Bluetooth and Wi-Fi are enabled. We were able to copy and paste text via a mobile data connection, but had a few issues pasting images until we enabled Wi-Fi. Let’s show you briefly how the copy and pasting process is performed, first from iPhone to Mac. 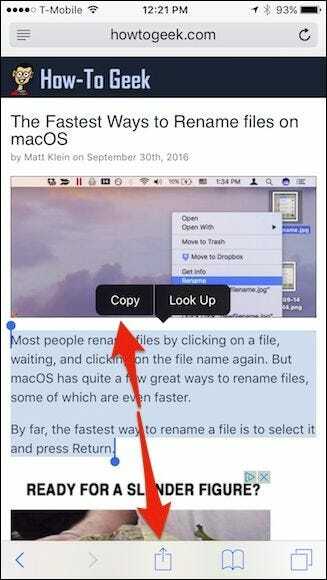 To copy a short bit of text in Safari from iPhone to Mac, select the bit of text on iPhone you want to copy. 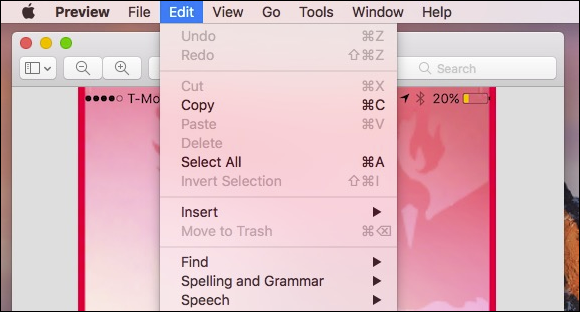 You can either tap the “Copy” button that appears from the resulting context menu. You can also tap the share button at the bottom of screen and tap “Copy”. Now, to paste the copied text into a new Note on Mac, open the Notes app, create a new note or open an existing one, and either head to Edit > Paste or press Command+V on your keyboard. As the following screenshot shows, the copied text now appears in the new note. The destination app to which you paste clipboard items shouldn’t matter. Whether it’s Pages, Notes or Word, if you can paste, it should work. Similarly, you should be able to copy from any app as well. Know however, results may vary, and in our experience, using native Apple apps will yield the most reliable copy/paste operations. Just as you can paste from iOS to macOS, so can you from macOS to iOS as well. Let’s copy and paste an image from Preview on Mac, to a note on iPhone. First, open the image in Preview and copy it using the Edit > Copy or by pressing Command+C on your keyboard. 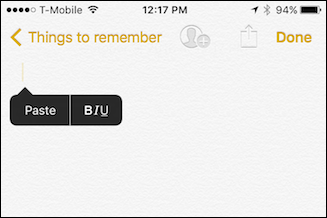 With the Notes app open, create or open a note. Tap on the note and then “Paste” from the resulting context menu. There may be a bit of a delay because the image has to first sync to iCloud and then to your iPhone or iPad, but soon enough, the image should be pasted into the target app. 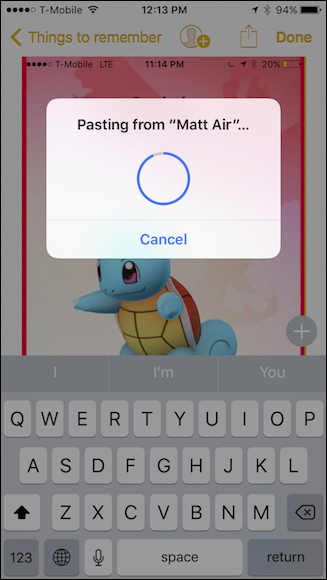 If you copy an image from iOS to Mac, you will see a notification that the item is being pasted from your iPhone to your Mac. In many cases, using the universal clipboard may not be the best method. For example, it isn’t more convenient than using AirDrop. What’s more, with some apps such as Reminders and Notes, content is normally synced, so you could just add content into a new note on the source device and it will appear automatically on the target device. There’s no doubt that universal clipboard has its uses, though. It just works, it’s seamless, and when it comes to pasting something into non-native apps, it is definitely useful. Further, there may be instances where you simply don’t want to AirDrop a file, in which case, universal clipboard is an excellent solution.